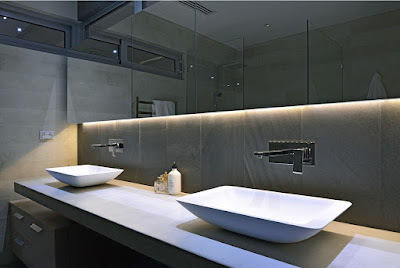 If you have recently decided to undergo a bathroom remodeling project, there are many things that need to be considered. For a project this big and important, it is essential that you go through all the necessary planning to ensure your remodel goes smoothly and you don’t hit any unexpected road bumps during your work. The very first thing you must do before you tackle your renovation is create a budget. You need to determine how much you are willing and able to spend on this remodel so that you make sure your aspirations don’t get any larger than your pockets. To do this, figure out the costs of materials, fixtures and extras you wish to include, as well as the cost of labor, unless you decide to do some of it yourself. During bathroom remodels, most of the time necessary amenities such as showers, toilets and sinks are out of commission, meaning certain arrangements will need to be made for where to take a shower and use the toilet. Therefore, you need to determine how long the remodel will likely take and how long you or your family can function without using this bathroom. Circumstances differ for everyone, so it is important to take time into consideration when planning a bathroom renovation. 3. What Are the Correct Measurements? Knowing a few important measurements, such as the dimensions of a normal bathtub and other bathroom fixtures and about how much space is needed for a toilet, can prove to be an important part of making sure your renovation proceeds efficiently. Also, you need to be sure you have the correct overall size of the bathroom and that you are aware of the location of plumbing pipes and electrical wiring. It doesn’t get much worse than going to the store and buying a bunch of materials that don’t fit. 4. What Design Style Do You Want? When determining the look you want for your bathroom, consider things like paint color, tile choices, vanities, showers, tubs, etc. Start to piece together some elements that you like, or even pick one design item you wish to feature and then work around it. When considering design, it is important to not overlook functionality, so also consider who will use the bathroom and how, the eventual resale of the house and how the design will fit in with the rest of the home. 5. What Are Your Needs & Wants? Differentiating between what you absolutely need for this remodel and what you would like to have can make a huge difference in making sure you stay within your budget and spacing constraints. Obviously, every bathroom needs a sink, a toilet, lighting, cabinets, etc., so be sure you map out where these will go first and how much they will cost, then move on to that glass shower or large relaxing bathtub you’ve always dreamed of. You can make this differentiation easier by considering where in the house this bathroom is, who will be using it, and its frequency of use. 6. How Much Ventilation Do You Need? Ventilation is a key component to any wet room, especially the bathroom. It aids in preventing mold and mildew and can also prevent the decay of wooden trim or features and the saturation of building insulation. It has been suggested that homeowners should install a vent fan with at least one CFM (cubic feet per minute) for bathrooms that are 100-square-feet or smaller. 7. Should You Hire a Contractor? Even if you plan on doing the bulk of the labor yourself, you should still consult with a contractor to determine best practices and what tools are necessary. Also, contractors are extremely helpful for the more difficult operations such as electrical, tiling and plumbing, so the smart thing to do would be to hire a contractor to work on the more complex aspects of the remodel at a minimum. After you take these seven things into consideration, you are ready to get started on your bathroom renovation. Be sure to shop Bathroom Place today for all the necessary materials to help make your new bathroom perfect!